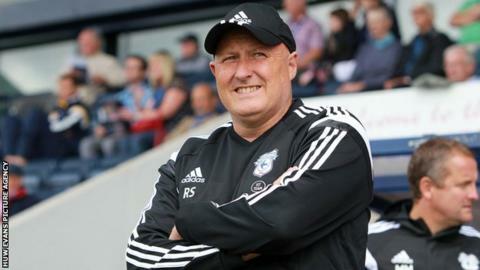 Manager Russell Slade believes Cardiff City are "more stable" than when he first took over as his first anniversary in the job approaches. The ex-Leyton Orient boss succeeded Ole Gunnar Solskjaer in October 2014 with the Bluebirds languishing in the bottom half of the Championship. Slade will mark 12 months in charge when Cardiff visit former club and league leaders Brighton on Saturday. "We are more together and there's a greater understanding," he said. "We've had issues to deal with, that's all part and parcel of being a manager today. "We have a set of rules and regulations now and I just think as a football club, on and off the field, we're probably in a more stable position than when I came in." Cardiff have only lost four times in their last 19 league games and Slade believes his team are capable of challenge for promotion this season. Slade said maintaining a top six spot was the target and the team's progress was a result of the changes he had been able to implement. "I feel the club is going in more of the direction I want it to in terms of a smaller squad and style of play, little issues like that that some people have seen as a problem," Slade added. "Can we be better? Do I want more improvement? Yes, I've asked for more improvement from the players this week. It's the small details sometimes that you need to get better. "I wouldn't ask them for that if I didn't think they had it in them." Defender Lee Peltier has returned to training this week after a leg injury and is fit for selection for Saturday's game at Brighton. Centre-half Ben Turner remains unavailable because of an ankle injury, however he will step up his rehabilitation next week and begin training on grass again.